This is the speed/mode selector. Press it to cycle through four options. Most impact drivers (including this one) have a variable speed trigger. 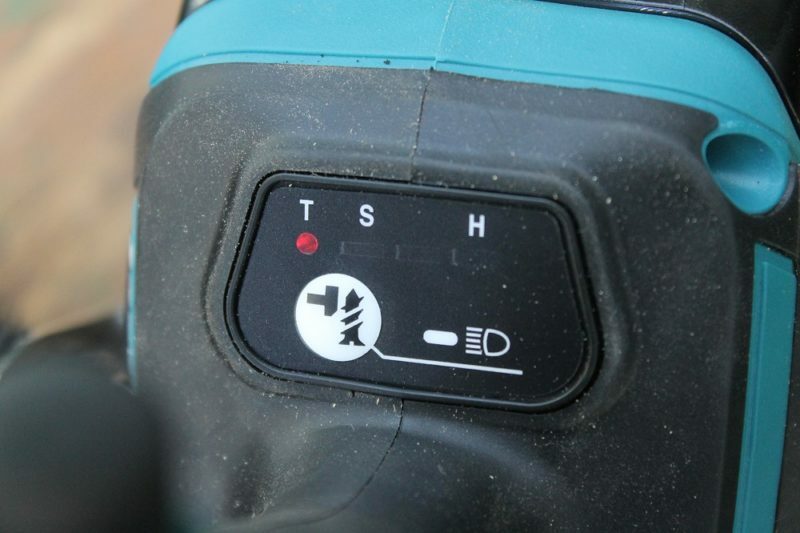 Makita takes it a step farther by giving you three different speed/power ranges to choose from: “hard”, “medium” and “soft”. Slower speeds dial back the number of impacts per minute (IPM), along with the maximum RPM. Currently in “hard”, the fastest, highest power setting. 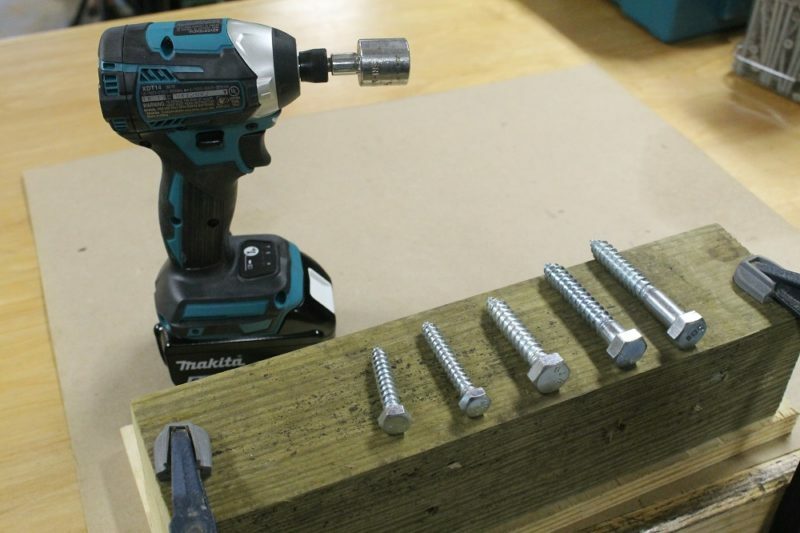 You no longer have to rely solely on hit-or-miss attempts at squeezing the trigger only “so much” when driving cabinet screws and other fasteners that can’t handle the tool’s maximum torque output. Or when you just don’t want to drive screw heads halfway through your project. 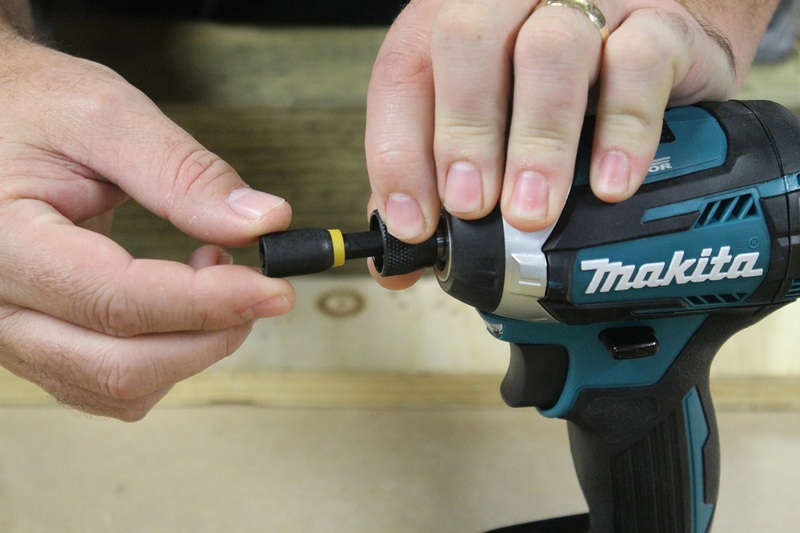 The XDT14 impact driver features a locking bit holder. Push a locking bit into the holder and it stays put. Pull the knurled collar forward to remove the bit. Small, but scrappy! 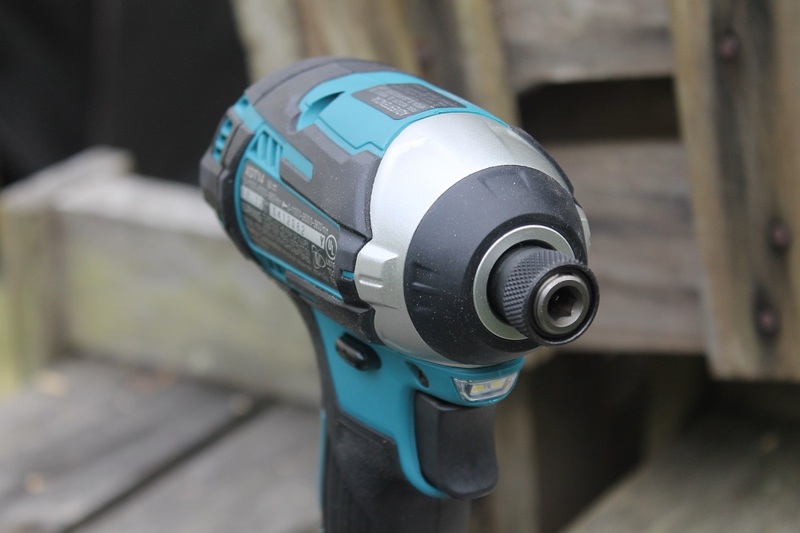 The 3 pound, 6 ounce (with included 5.0Ah battery) XDT14 impact driver is no pushover. 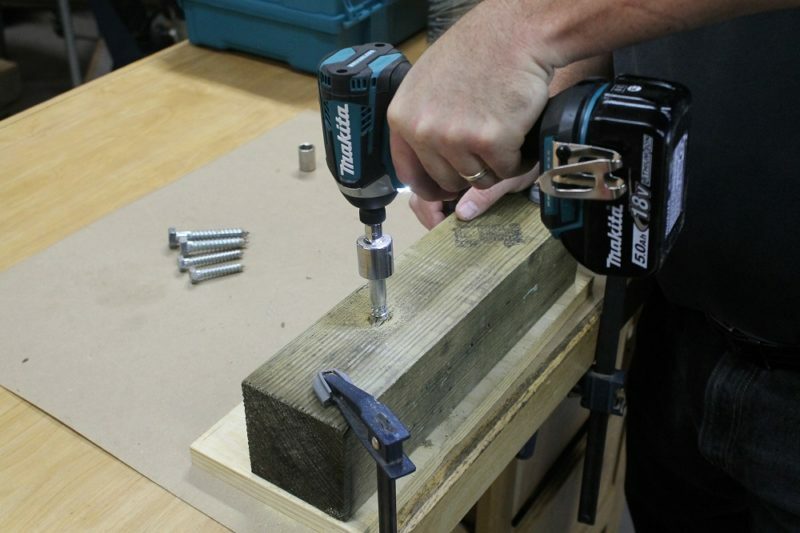 The XDT14 impact driver is a compact tool that permits access to some pretty tight areas. Overall front to back length is only 4-5/8” (plus the tip of your bit). Just don’t confuse compact size with compromised performance. It has no problem driving fasteners from cabinet screws up to and including some lug nuts (though it’s not meant to be a tire changing tool). I drove some lag screws into a pressure treated 4×4 with no pilot holes. The result was very impressive. 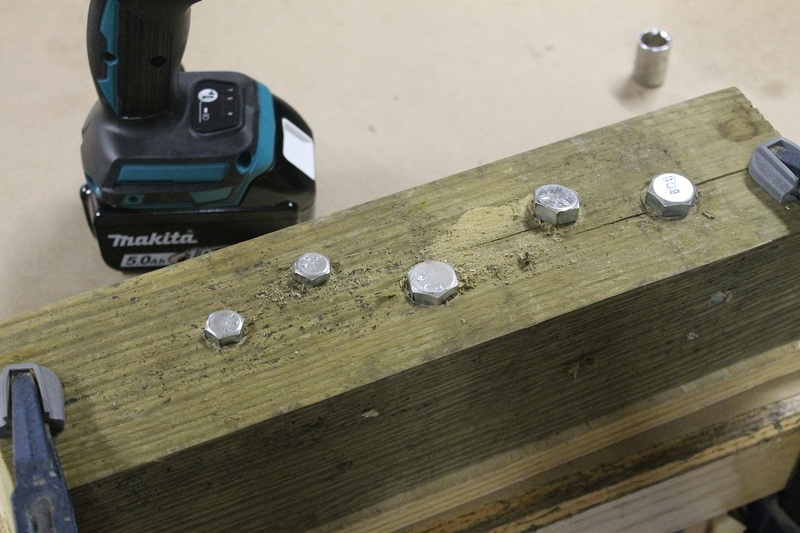 The Makita XDT14 impact driver effortlessly sank these screws. Two 3/8” lags (2” and 2-1/2” long) and three 1/2” lags (2-1/2”, 3” and 3-1/2”). 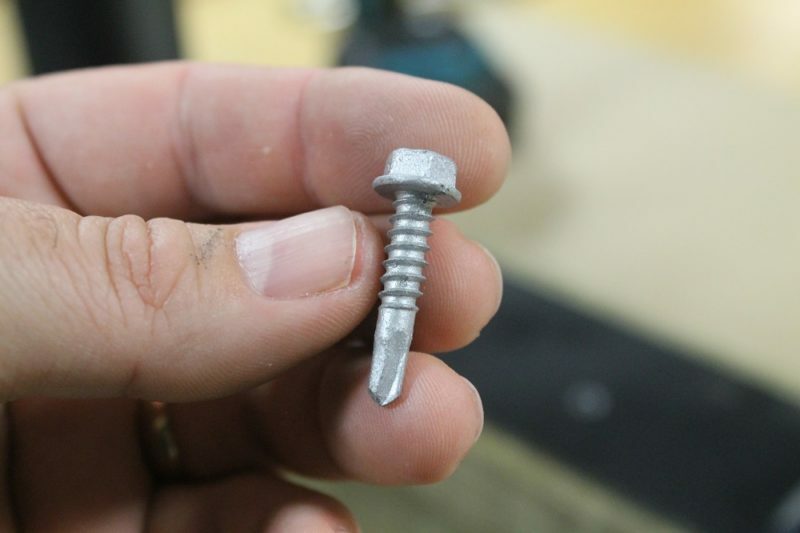 When you drive 1/2” x 3-1/2″ lag screws with no pilot holes you realize just how powerful this tool really is. I’ve got to be honest here; I’m impressed. No one will ever accuse this driver of goofing off on the job, that’s for sure! Drilling with a 1-1/2” Bosch Daredevil spade bit. 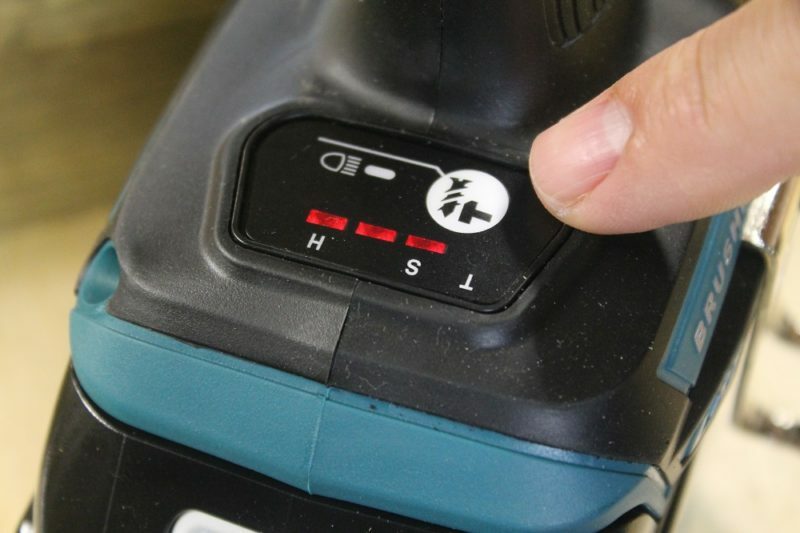 The Makita XDT14 automatically adjusted to the required torque with never a hint of struggle. If you’re old enough (or cool enough) to have learned to drive a manual transmission car, you may have noticed a horrified grimace on your dad’s face as he frantically exclaimed the subtleties of a clutch pedal over the grinding sound of gears being reduced to powder. Shearing the head off of a screw can be a similarly pucker-worthy experience. The magic of an impact driver is that you can torque the hell out of something without so much as twisting your wrist. Quick-Shift Mode is controlled by an electronic circuit (it’s not something you can select manually) that performs kind of like a stick driver who’s crested the learning curve. It automatically downshifts into a lower gear (reduced speed and IPM) to minimize thread stripping and risk of fastener breakage. T mode is great for smaller, thinner screws. After the three speeds, the forth setting is “tightening mode” (referred to as “T mode”). T mode starts out fast, then slows way down when impact kicks in. This mode quickly drives the screw into the wood, then becomes a lot more delicate and controllable as required torque increases. I can’t quite put my finger on it, but it feels like the initial speed of “hard” mode followed by the slower, more controlled power of “soft” mode. 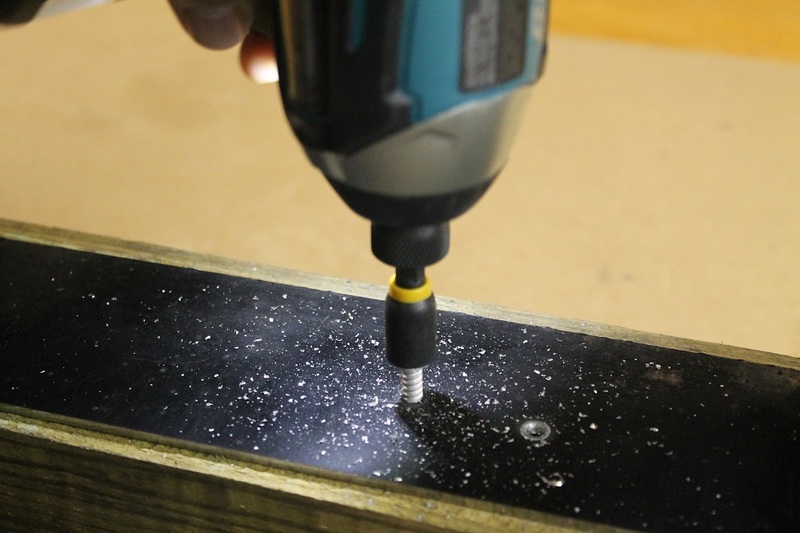 T mode also works great with these self-drilling screws. 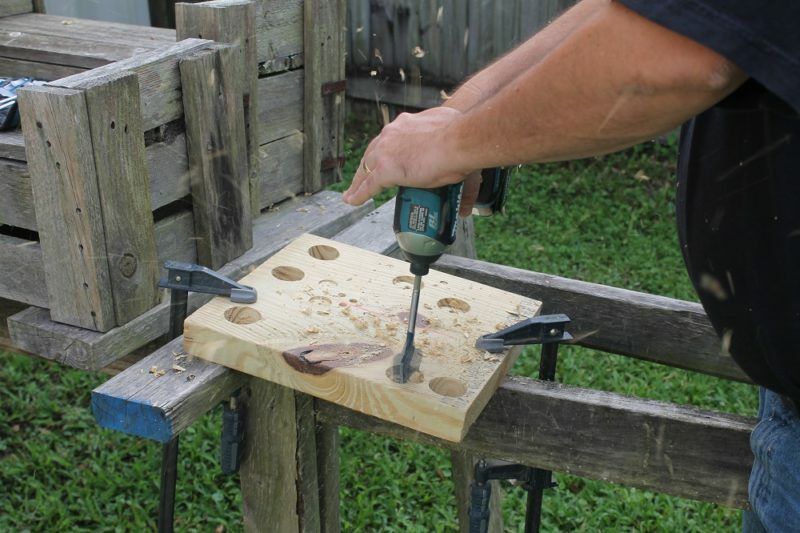 Drilling through 1/8” steel and into wood. 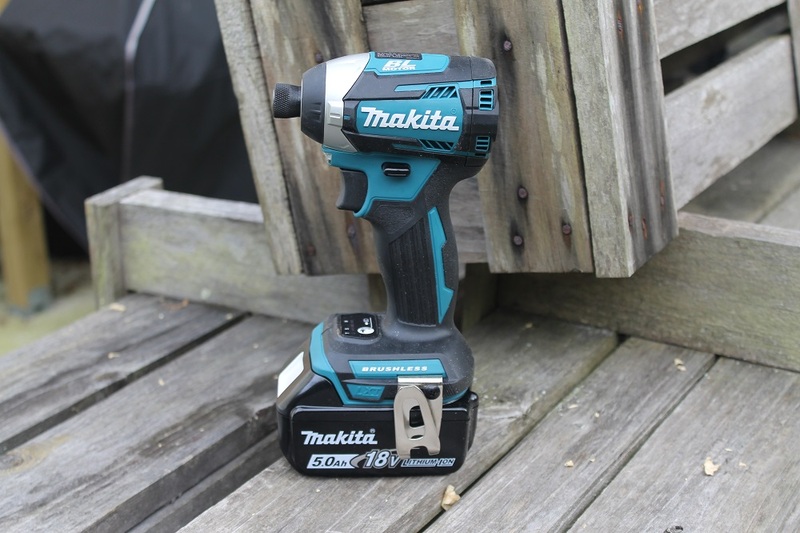 Makita XDT14T includes two batteries and a fast charger. 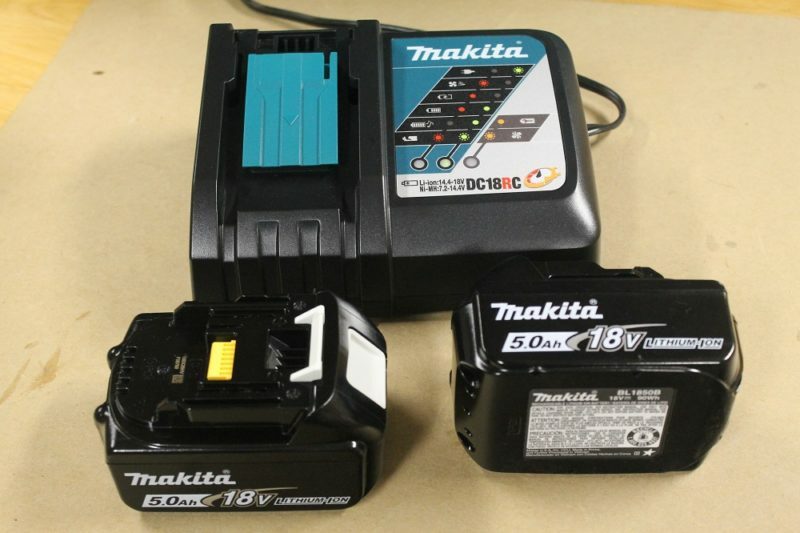 18V LXT batteries feature Makita “Star Protection” circuitry to prevent overheating, overcharging and over-discharging. Basically, it makes sure the battery is always on its best behavior. 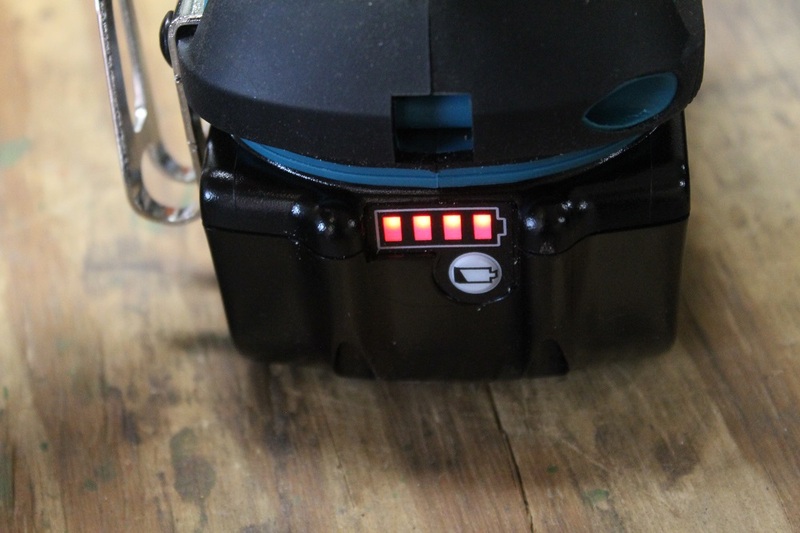 The batteries have an on-board fuel gauge so you know when it’s almost time for a recharge. 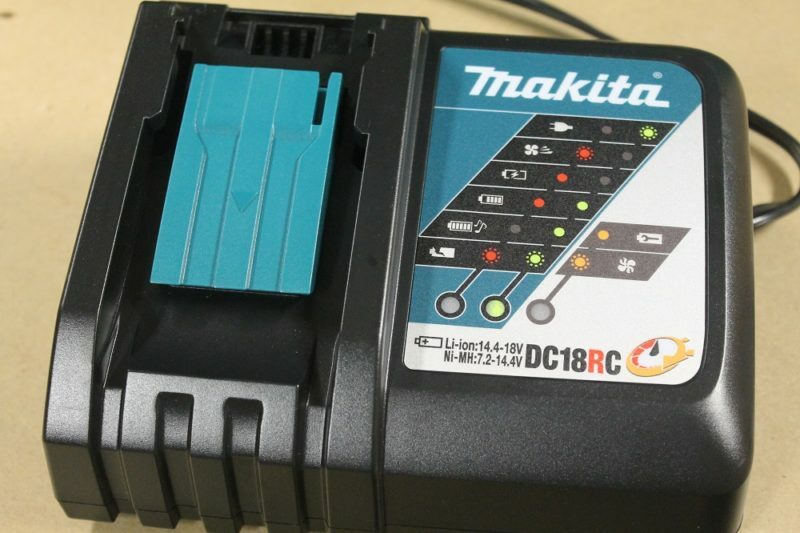 Makita’s DC18RC fast charger comes with a lot of their kits. It’s quick, communicates with the battery’s built-in chip to optimize the charge cycle for maximum battery life, and joyfully plays you a song when charging is complete. Dinner and a show! The DC18RC charger has a forced air cooling fan to reduce charge time, and a selection of “Hey you over there! Your meal is ready!” melodies to choose from (or silence, if you prefer). The only negative I see is for those of you who like to hang your chargers on a wall. You will have to come up with a shelf or bracket of some sort because the DC18RC has no keyholes slots on the bottom. 5.0Ah (included in this kit) = 45 min. 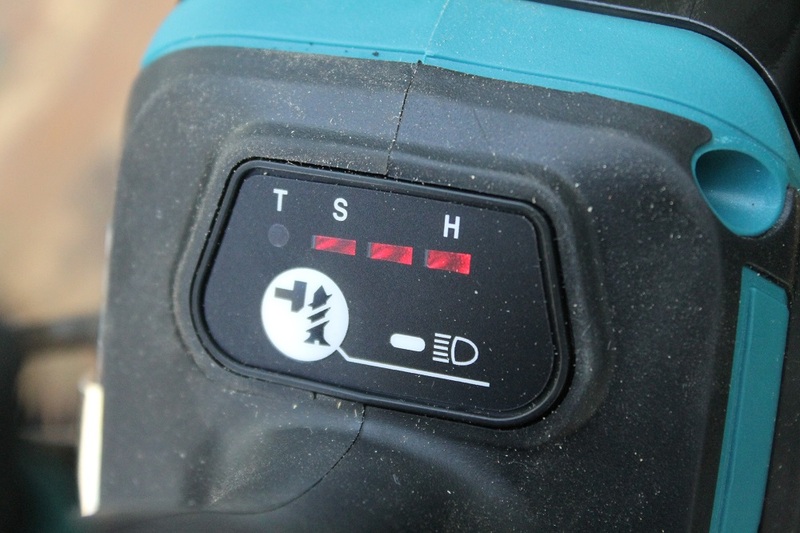 Makita battery packs bearing the star logo contain a protective circuit board that keeps things operating at top performance. The LEDs turn off 10 seconds after releasing the trigger. I appreciate that you can use the light if you want, but you aren’t forced to. 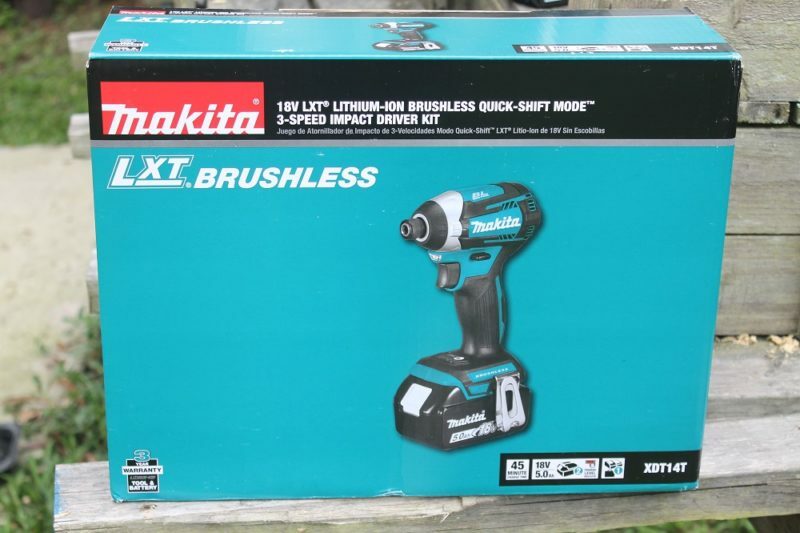 Thanks, Makita! LED lights on the front of battery powered tools seem to have become an obligatory bandwagon these days. No one wants to be left behind. “If Johnny jumps off a bridge…” You know the saying. Granted, they’re great when working in a poorly lit area. You can call me ungrateful, but I often find them rather annoying and distracting. And I never understood why manufacturers insist on the light always coming on (and staying on) whether you want it to or not. Until now, that is. As if the XDT14 wasn’t already impressive enough, Makita scored some extra big brownie points by actually giving me the option to NOT use the light when I don’t want to! And once you turn the light off, it stays off until you decide you want it on again. Seriously, other guys, why is this so difficult? It’s such a small thing. But it’s huge. Now this is how it’s done! There are compartments for everything, and it’s not one of those overly bulky blow molded cases that we traditional take straight to the circular file. My gripe against lights that can’t be deactivated on most other tools may be petty. I get that. But one other area that many manufacturers tend to overlook on a regular basis is the storage case; and that’s not so petty. 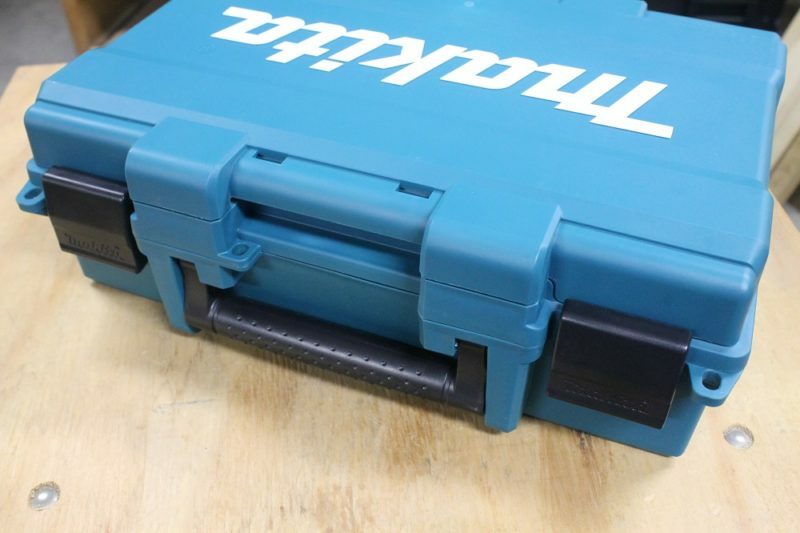 Makita XDT14T’s storage case is made of super tough, durable ABS plastic. The handle is hefty, the latches are beefy and the hinges aren’t going to blow out on you any time soon. 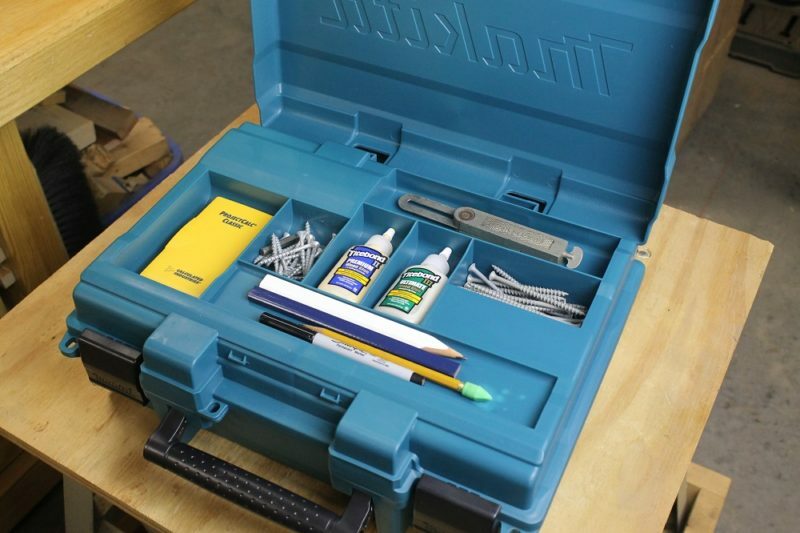 When a tool comes with a storage case – hard or soft – no one wants a single cavernous compartment, where the tool, batteries, charger and accessories all clank and clatter against each other. We love our tools – our investment – and want them sufficiently protected. It took me about an hour to discover this little Easter egg hidden in the lid (contents not included). 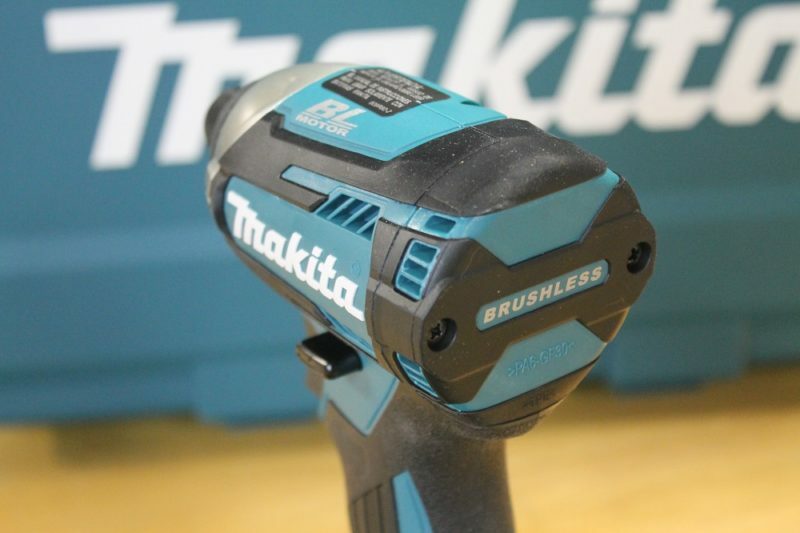 Perfectly sized ergonomic grip, belt hook, compact size, monster power, great battery life, awesome features… The XDT14T is the perfect kit for anyone wanting an excellent impact driver! Honestly, the entire compact tools category – across pretty much all major brands – has reached the point where it’s almost moot to mention that they’re “as powerful as” many of their “full sized” counterparts. Or to bother counting how many fasteners they can drive on a single charge. A compact, brushless motor for high power and long battery life in a low weight package that won’t wear you out. 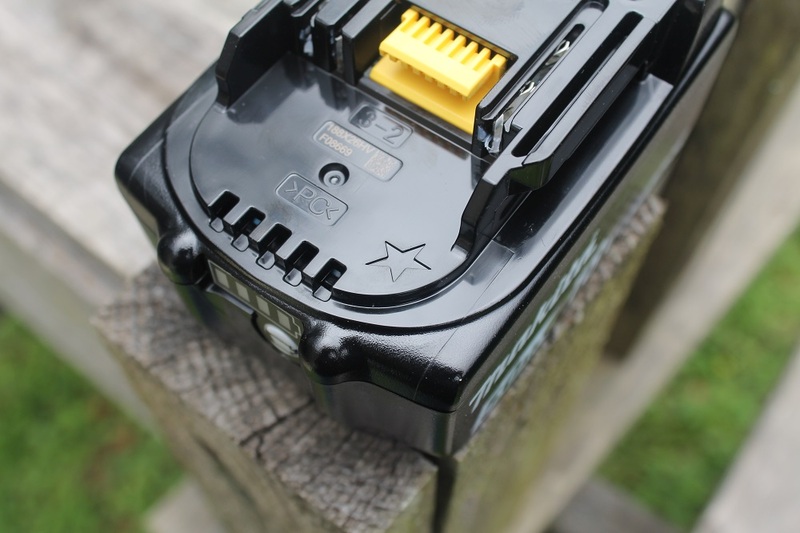 The fact is, with the brushless motor, the two 5Ah batteries and the fast charger included in this kit, you’re not likely to find yourself standing around the job site waiting for fresh battery power. By the time one battery is spent, the other has long since recharged. 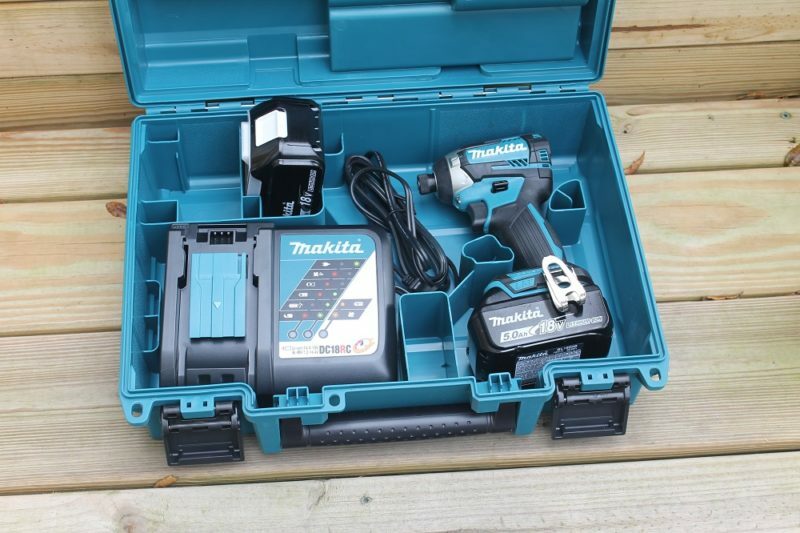 Makita XDT14T impact driver kit. 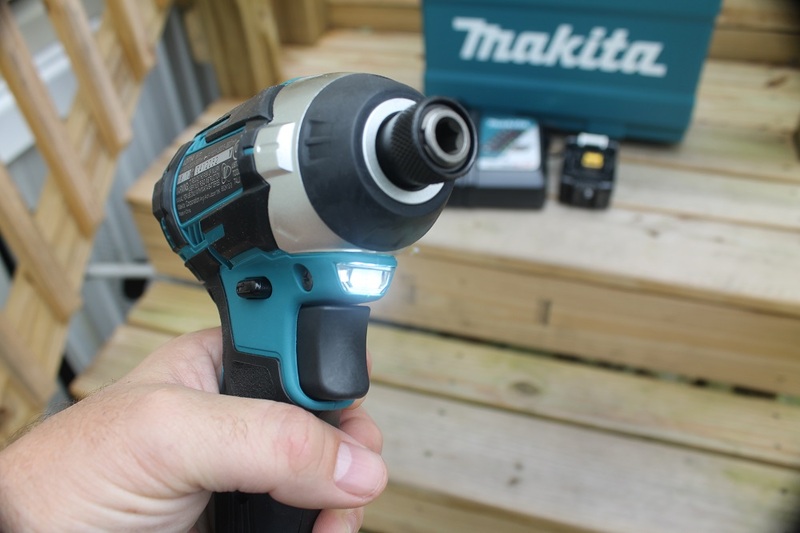 The Makita XDT14 impact driver is a workhorse with respectable power. It will easily handle just about anything you might ask it to do. But where it really stands out for me is with the three speed ranges and – believe it or not – the seemingly trivial ability to turn off that darned light when I want to. Why doesn’t every tool have that option? Sometimes it’s the little things that make the biggest difference. 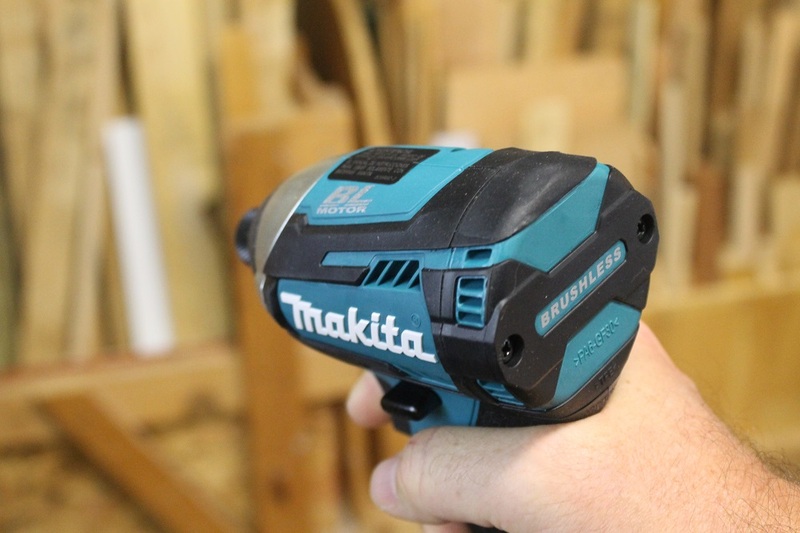 Makita’s XDT14 impact driver is a present wrapped in goodness and topped with a bow. And the kit only sweetens the deal.